And there I was, on top of the world, watching the vegetation, the temples and rock formations. Researching life in the Himalayas. Walking the endless narrow trails I was hoping not to bump into a snow leopard. It was easy to imagine that at any moment we could get a glance of a Yeti or Vasu from behind one of the many bushes. When we started working on our webcomics: The Golden Lion and decided it would be set in the Himalayas, we used our imagination to recreate it. We collected all the material available on internet and testimonials from people who’ve been there. Although we were not far from an acceptable representation, walking in the mountains, feeling the icy wind descending from the top of the ridge was an irreplaceable experience. It’s like diving into a world where every step we experience something that can be turned into a new story. Tomorrow we´ll post the last page of Chapter 1 of The Golden Lion. And to celebrate these 6 months of weekly publication, we would love to share some of the process of creating the cover. 1. The first image shows the sketch. Very loose still, but close to the final result. 2. The second image shows the inked page. Quite a conventional process really. 3. Once I´m happy with it, I scan the page and colour it in photoshop. In November last year, we had a great meeting in London. Daniel came over from Sydney and we worked intensely for 2 weeks. We managed to create the structure of the entire story, all the 4 chapters of Golden Lion. Now we only need to draw, ink, colour and letter it. Everything will be done within 2 years. The process of costume research can sometimes be very time consuming. When you are developing an original phantasy world you know books and google won´t give you a straight answer. But the time spent always pays off. Usually I do thousand sketches before I find a design that makes me happy. I love the balance between black and white and areas with ornaments and plain ones. The symbol in the centre of his chest suggests a chakra or energy centre from the yoga literature. After a long pause working on the script of our graphic novel, we are back to the drawing table. I know it took a long time however comics creation is much more time consuming than most people think. At the same time in terms of freedom and artistic expression it´s very personal rewarding. You don´t need a few hundred thousand dollars to explode a car and there are no producers to tell you that the main character needs a romance interest to make the story more appealing to the general public. You just need paper, a pen and an idea. 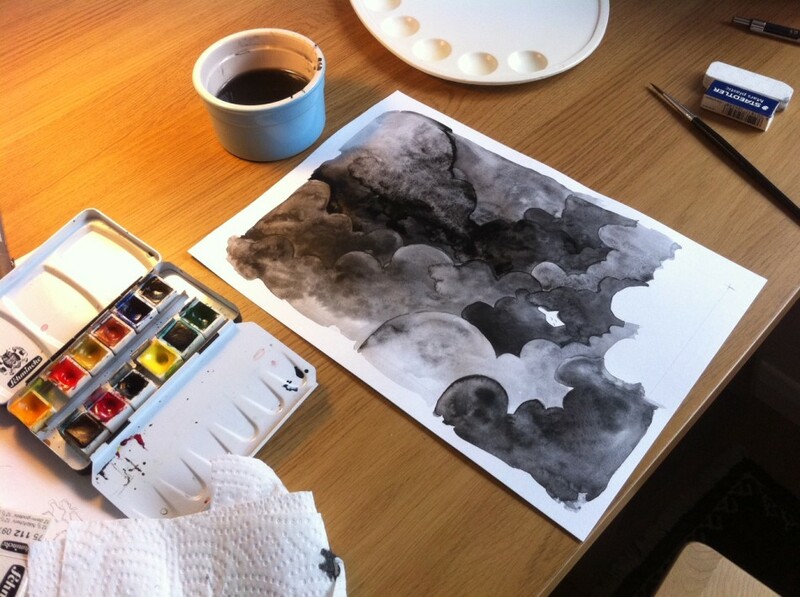 In the picture below, I´m using water-colours in a dream sequence for our next project. 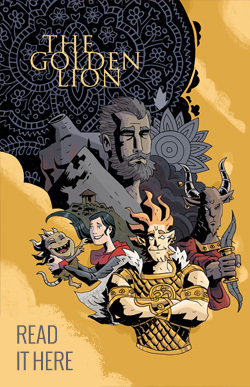 The final chapter of The Golden Lion graphic novel begins. Chapter 4 starts with a flashback sequence when immortal warriors try to prevent Illusion from initiating the Kali Yuga – the age of Darkness. Check out our video and share it with your friends.